Often the monotonous routine gets to us! To rejuvenate your weary body and mind, there is no better therapy than travel. If you can’t manage a long vacation, make use of the weekends. As you kickstart 2019, pledge to explore and breathe in the natural beauty of small towns of India. With these 17 awesome weekend getaways under 5k you no more need to think about budget constraints while planning an escape. Here is the list of top 17 weekend getaways under 5k from Delhi for your next trip. These destinations are budget-friendly as well as perfect for an amazing trip. Take a look! The Pink City – Jaipur – is also the capital of Rajasthan. It exhibits the essence of Rajasthani heritage, right from its history to the flavorsome local food. And it is one of the best weekend getaways from Delhi for culture vultures, art aficionados, and history lovers. 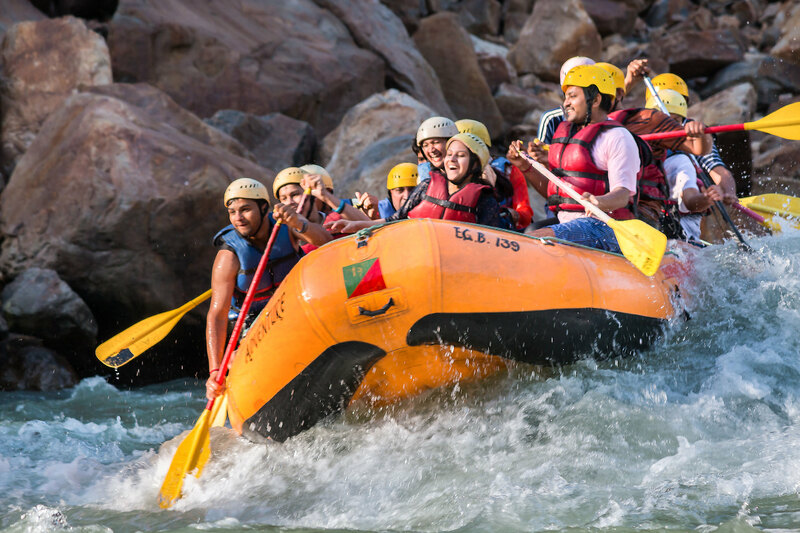 Rishikesh attracts a large variety of tourists, but the primary attraction here is adventure. Right from camping and rafting to bungee, there is a lot you can do here. At the same time, it is also a soulful city where the holy Ganges flows and the tinkle of temple bells sanctify the aura. One of the best weekend getaways from Delhi under 5k, it offers a lot to explore for adventure-junkies, spiritual seekers, and nature lovers. Key attractions: Camping & River rafting in rishikesh, bungee jumping in rishikesh, and cliff jumping. Cafes near Lakshman Jhula offer delicious food at reasonable rates. Paragliding in Bir Billing features in almost every adventurer’s bucket list. Realize your dream by planning a weekend getaway to this beautiful town of Himachal. This Himalayan getaway is also known for housing a number of Tibetan monasteries and Stupas. Manali is one of the most famous hill stations in India. The town acts as a gateways to other picturesque locations like Lahaul, Spiti, and Leh. With crystal clear River Beas flowing through the mountainscape, it is the ideal destination for a quick escape. Doable with just 5k in your pocket, it is also a great pick for a trip with friends. Key attractions: Camping in Manali , Adventure activities like paragliding, rafting, & skiing and tourist attractions such as Hadimba Temple and Rohtang Pass. No wonder Manali is among the best places to try adventure sports in India. Jim Corbett National Park is among famed national parks in India, and one of the ideal weekend getaways from Delhi for the wildlife-enthusiasts. On a trip to Jim Corbett, you get to spot over 580 species of birds, and 50 species of mammals. Key attractions: Jim Corbett National Park is known for being home to the Royal Bengal Tigers. Indian elephants, spotted deer, golden jackal, Himalayan black bear, and leopard cats are among other animals you may spot while on a jungle safari. Corbett Museum, and Corbett Falls are added attractions. The Queen of Hills and the capital of Himachal Pradesh, Shimla boasts of British charmand natural beauty at its best. It continues to be among popular tourist places and getaways near Delhi. Forests, shops, temples, or even a developed township, Shimla has it all! The City of Taj, Agra is the place that attracts tourist around the globe. After all, who wouldn’t want to steal a glimpse of one of the Seven Wonders of the World, the Taj Mahal!Agra proudly forms the Golden Triangle Circuit of India, which consists of three cities – Agra, Delhi, and Jaipur. Mcleodganj or the Little Lhasa is tucked in Kangra District of Himachal. Embraced with nature and sprinkled with Tibetan ethnicity, it is one of the best weekend getaways from Delhi that can be easily planned in 5k. Monasteries, Library of Tibetan Works and Archives, Tibetan Institute of Performing Arts, and even the local cafes give an insight to the Tibetan culture. Key attractions: Monastery visits, shopping, cafe-hopping, Yoga and trek to Triund are some of the best things to do in Mcleodganj. Kasol is a tiny village in Kullu, perched right beside the glistening Parvati River. Besides natural beauty, it offers a number of easy to moderate treks, lovely cafes for foodies, and a lot of serenity..
Udaipur – the City of Lakes, hypnotizes with its history and remnants that flaunt immaculate sculpting and intricate carving. Beautiful lakes elevate the charm of city to a whole new level. shopping in Udaipur is an affair filled with vibrant, colorful knick knacks and more. There’s never an end to what you can indulge in here; watch the sunset on a boat, uncover the mysteries as you take a heritage walk across the various attractions of Udaipur. Key attractions: The lakes of Udaipur are, undoubtedly, a key attraction and taking a sunset boat cruise is among the best things to do in Udaipur. Binsar is a quaint hamlet of the Kumaun region of Uttarakhand. The place is peaceful and serene. It is one of the most affordable weekend getaways from Delhi and is a 10-hour journey. Head to Binsar if you are looking for a quiet time amidst the hills and nature. Amritsar is one of the most visited cities in north India, because of the famous Golden Temple. It is also an ideal weekend trip from Delhi, as it is an overnight journey. Other places to visit in Amritsar are the Wagah Border, and the well known Jallianwala Bagh. This is one of the visited places in India, especially because of the tiger reserve there. Located close to the Aravali ranges, this is an amazing travel destination. The place is both peaceful and exciting for animal lovers. Head here for a weekend, and experience the wildlife safari. This is a small town in the Nainital district of Uttarakhand. Situated in the Kumaun hills, the town is serene and peaceful. If you are looking for cheap weekend getaways from Delhithen Mukteshwar can be considered. Spend a day or two in the beautiful mountains away from the city rush. Situated on the banks of the river Ganga is the holy city of Varanasi. It is a common destination amidst travelers, as it is a budget destination and does not burn a hole in one’ pocket. Spend some time at its Ghats and go for a boat ride in the Ganges when in Varanasi. Also, do not forget to roam around in the streets of the city. Mussoorie is a beautiful hill station at a distance of 30 km from Dehradun, the capital city of Uttarakhand. It is an amazing weekend travel destination to go with your friends. Stay in the mountains and hike to the extreme points of the city. Also, do not forget to gorge on bakery items at Landour. Dehradun is a beautiful town located in a valley. Sloping roads with trees on both sides are the beauty of this city. The temperature is pleasant throughout the year making it an amazing getaway destination from Delhi. It is a top choice for weekend getaways from Delhi within 300 km. So, now you can save for the bigger travel destinations, and not compromise on traveling altogether! Let no weekend go to waste. Book your weekend trip with Adventuria now! Thrillpedia is Travel Blogs section of Adventuria.in. It contains all information of famous natural locations, Adventure Sports and Adventure places of India, where you could visit. This blog is more focused on Adventure Sports and Adventure Locations of India. All locations have been verified and personally visited by Adventuria.in team.